We reckon that the European economy was too fragile for the euro to be able to capitalize on the abrupt change in tone from the Fed or the threat to the credibility of US policymaking. This stance hasn’t necessarily altered in the intervening period, even though the Fed has now gone even further in signaling not only a shift in stance but also potentially a change to its reaction function, one that is more permissive of an inflation overshoot. Crucially for EURUSD, the European data flow remains distinctly poor, Italy, for instance, is languishing in a self-inflicted recession, and the ECB is now acknowledging the persistence of these downside forces in a way that suggests it could temper its forward guidance on rates, potentially as soon as the March ECB meeting when the staff forecasts are next updated. Whereas it was understandable that EURUSD popped higher on the Fed, it is also understandable that the euro has been unable to sustain, let alone build on, those advances. Please be noted that EURUSD shows convergence between implied volatility (IV) and historic volatility (HV) curves, the trend of lower vols is still imminent. 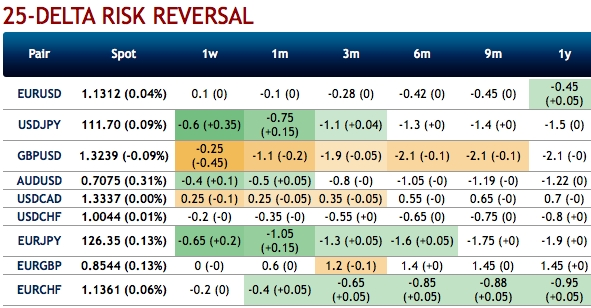 Also, be noted that spot and risk reversal curves. Volatility traders perceptibly expect only about what is likely to and what actually turns out. As you could observe the above chart, Jan’2018 seems to be an average month as the divergence between implied volatility and historic volatility. IVs have constantly been sliding, while RVs are also following. While spot curves move in tandem with the risk reversal curve until of-late, now they are also showing convergence. We could foresee potential for further USD strength and limited risk of significant USD weakening this year, and notably, our EURUSD forecast is now running close to forwards on all horizons (vs previously above) and across tenors. From this perspective, the real far-off month, when HV is actually lower than implied volatility, then the only such instance of convergence during the recent timeframe observed. While 3m positively skewed IVs have stretched on either side to signal both upside and downside risks. Skews stretched towards both OTM calls and OTM put strikes signifies hedgers interest on either side. Currency Strength Index: FxWirePro's hourly EUR is flashing at 70 (bullish), hourly USD spot index is sliding towards -96 levels (which is bearish), while articulating (at 07:18 GMT).